Fico di Amalfi – the perfect summery Fig! I’m in love with this scent from Acqua di Parma. I was wrongly convinced, at first, that this was a male fragrance, but only because my friend Justin was wearing it last weekend! It is, according to the blurb, unisex, though a quick Google tells me that it was launched at the female market. So I’m guessing that anything goes when it comes to Acqua di Parma – it’s a one-size-fits-all! You’ll be familiar with the classic Acqua di Parma, surely – that yellow packaging that immediately makes you want to catch the first flight out to the mediterranean? 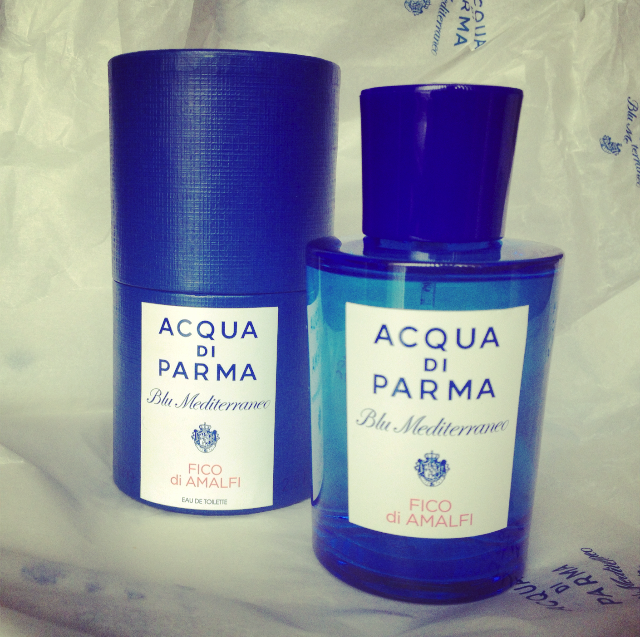 Well the Fico di Amalfi is part of the ‘Blu Mediterraneo’ range which has recently had a bit of an overhaul. The bottle and the outer packaging has been brought in line with the original range – thick glass bottle with the handmade outer cylinder, all in a deep-sea blue. The Blu fragrances are all very light and fresh with lots of lemon and bergamot and citron notes going on. Rather like a classic cologne, really! I’m not overly keen on those very citrussy notes when they’re not balanced out by something a little deeper, so I think that’s why I’m most drawn to the Fico di Amalfi – it’s VERY figgy with slightly more depth than some of the others in the range. A fruity, bright, summery fig fragrance. This is a light fragrance that you can really spritz again and again with no risk of overdoing things. Absolutely perfect for taking travelling when you don’t want a heavy, cloying perfume. If you prefer that unadulterated “cologne” fragrance, purely citrussy and fruity, then I can point you in the direction of the Arancia di Capri – orange, mandarin and lemon dominate with just a little hint of muskiness.